According to Igor Faletski, CEO of Mobify, 2017 is going to be a turning point for mobile commerce in Europe and North America. 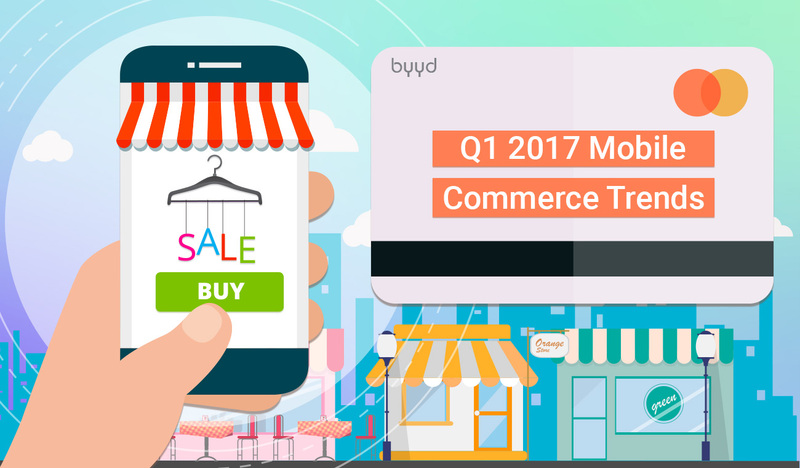 The figures derived from Mobify’s 2017 Q1 Mobile Commerce Insights Report point to the fact that mobile revenue will surpass desktop on a large scale this year. The report provides valuable tips for those brands and retailers who wish to benefit from the expected increase in mobile revenue. In this article, we are going to take a closer look at some of those insights. Web push notifications are welcomed by those who prefer mobile shopping. Online sales have coped with recession years considerably better than offline sales, and their increase shows no signs of slowing down. 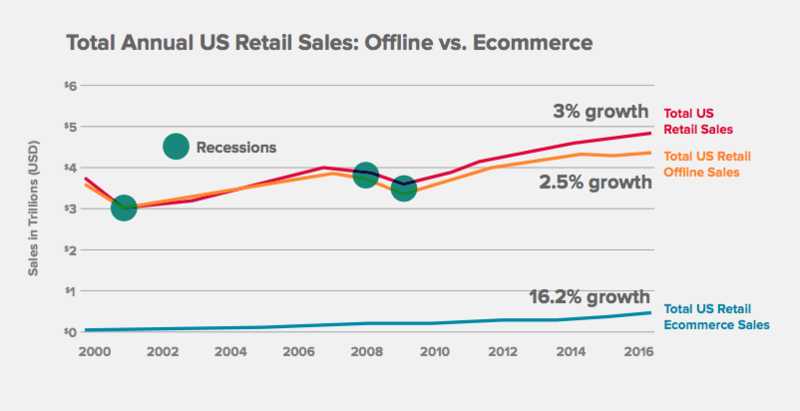 In fact, 2015 witnessed a higher absolute dollar increase from online sales than from offline retail, and by 2019, online is predicted to become the main source of retail sales increase. 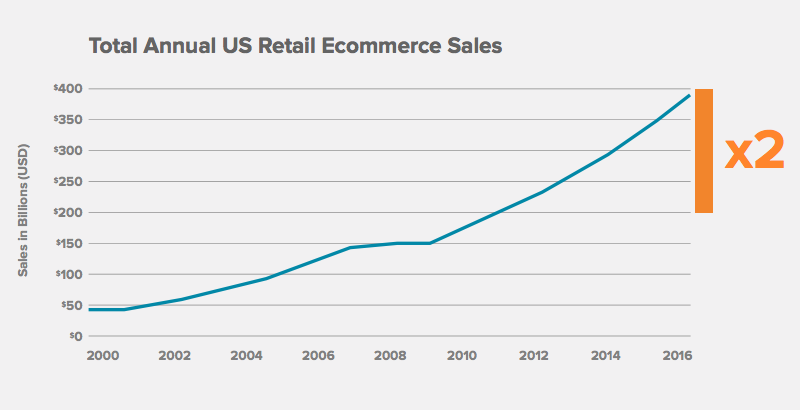 As Figure 1 shows, online sales have shown an almost exponential growth since 2000 at 16.2% per year. 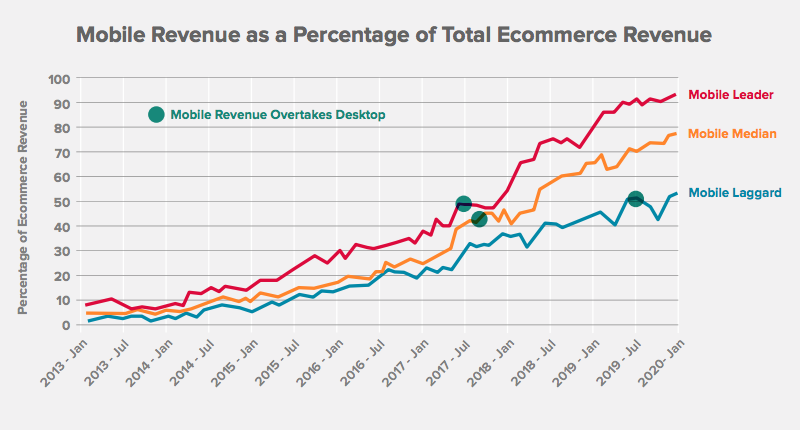 Moreover, the past 5 years have witnessed Ecommerce revenue double (Figure 2). 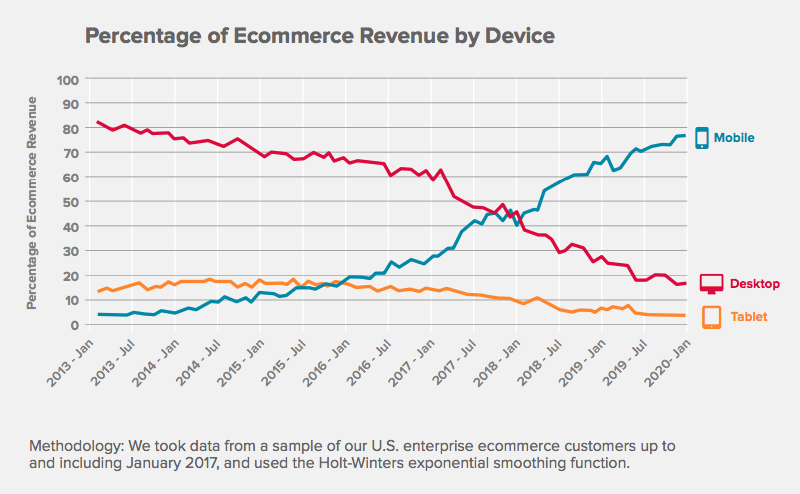 The source of that 16% increase in online sales is pretty obvious: the growth comes from mobile. Mobile traffic is, in fact, already dominant: in May 2015, mobile traffic overtook desktop traffic for large retailers. In March 2016, the same thing happened to medium retailers. Finally, mobile traffic surpassed desktop for small retailers in May 2016. But what about mobile revenue? When will it catch up with desktop? Mobify’s report suggests it will happen as early as in the second half of 2017, just in time for Black Friday. However, just like mobile traffic, mobile revenue will not increase simultaneously for each retailer in the market. Mobile leaders will experience the effects as early as in Q3 2017, while Q4 2017 will bring those effects to mobile median. As for mobile laggards, they will have to survive till Q3 2019 in order to see their mobile revenue overtake desktop. Enhanced Security. Shoppers want to feel safe about their payments. Studies show that large lock icons and frequent usage of the word “secure” at checkout make the experience more appealing to customers. 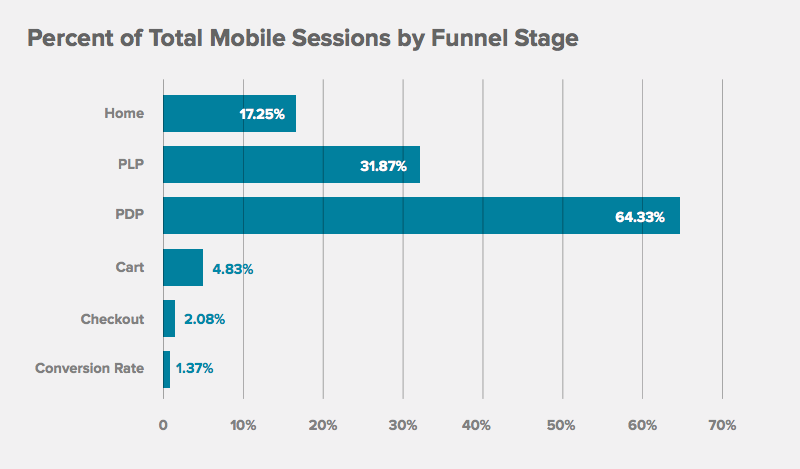 Now, let’s take a look at the mobile funnel. Figure 5 shows that the product display page (PDP) is visited almost 4 times more often than the homepage; it also points out that there is a drop-off between cart and checkout in 57% sessions, and between checkout and conversion in 34% sessions. In other words, the mobile funnel is broken. Customer behavior is hard to track, as shoppers tend to enter and leave at different stages. The course of action suggested by Mobify is to optimize popular entry points (such as PDPs) and to identify problem areas where friction resides. 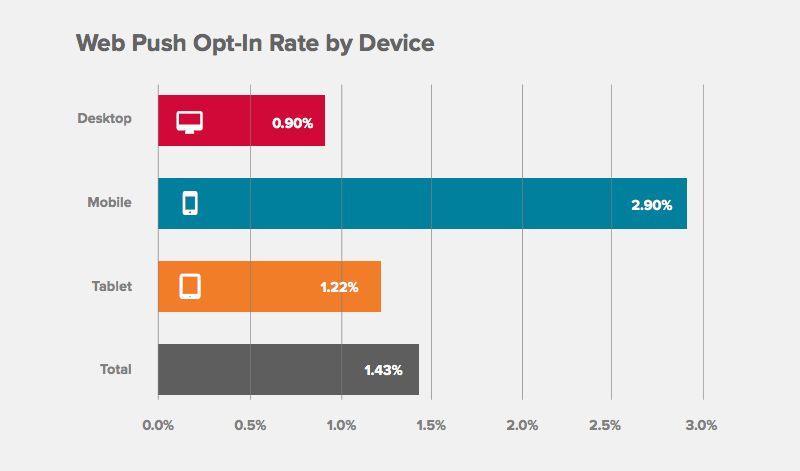 Figure 6 suggests that opt-in rate is 3.2 times higher in mobile than in desktop; mobile opt-in rate is also 2.4 times higher than tablet. 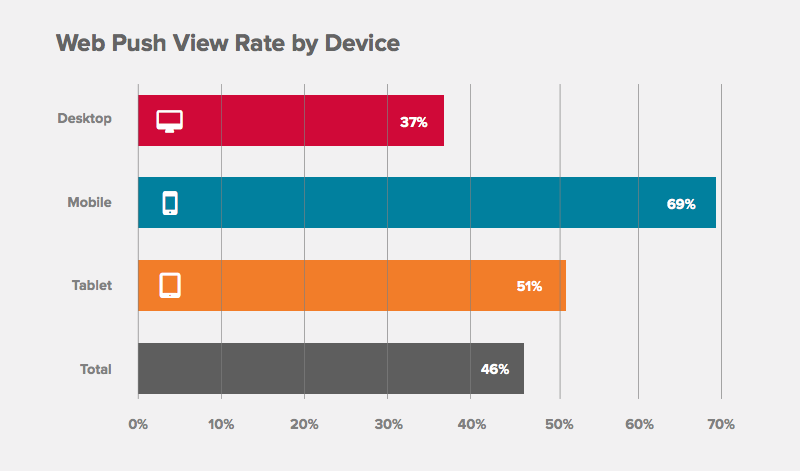 As shown in Figure 7, mobile view rate exceeds desktop by 86% and tablet by 35%. 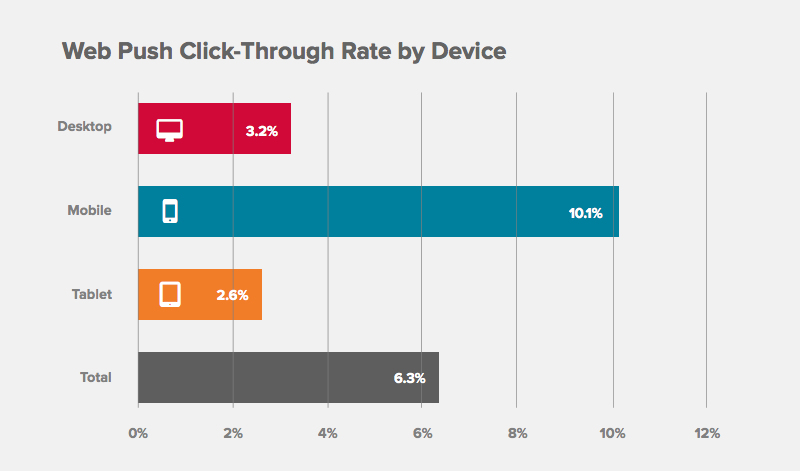 Mobile CTR is more than 3 times higher than tablet or desktop, as shown in Figure 8. 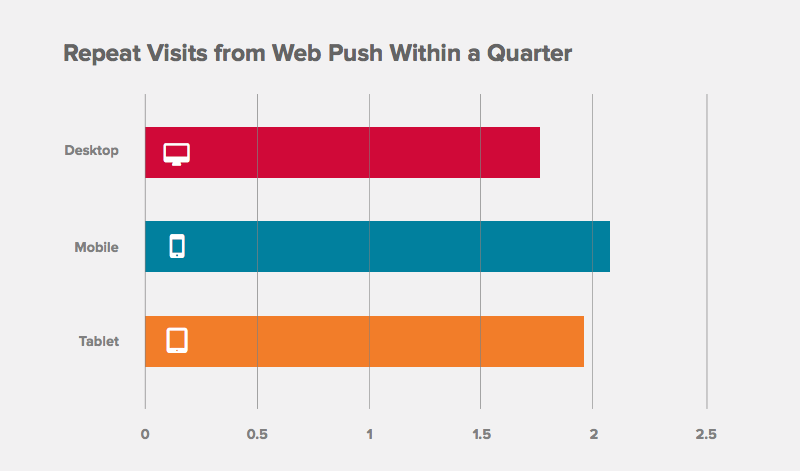 Figure 9 shows that subscribers are likely to return twice per quarter through web push notifications. Mobify’s report regards web push notifications as a valuable tool that can convert traffic into revenue. Given the dominant position of mobile traffic, web push notifications should be viewed as a highly efficient channel for engaging mobile shoppers. Opt-in, view and click-through rates can be optimized by observing the best practices regarding web push notifications.